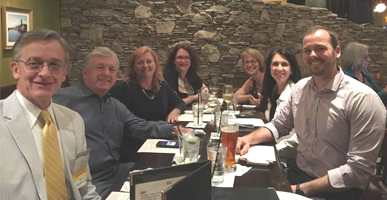 We welcome back members of our Illinois Delegation who return from 3 successive days in Boston, MA for APTA’s 73rd annual Delegate Assembly. During which time, the Delegates are tasked with making decisions on issues that have far-reaching implications for the association and for the profession of physical therapy. Illinois is fortunate enough to have elected a diverse representation from various practice settings and years of experience. Upon their return, we asked our first-time Delegates to share some insight on their experience at the House. Julie, What was one thing that surprised you about the whole experience? Julie Schwertfeger, PT, DPT, MBA, At-Large Delegate: "Wow, House of Delegates is an immersive, exhaustive, and inspirational experience. Having sat in and streamed these in the past, and having followed RC discussions, it was surprising the degree to which being part of the discussion changes this experience. Reaching out to colleagues from across the US in order to discuss their concerns on Illinois’ RC was exciting leading up to ‘the House’. Discussion sparked dialogues on professional governance priorities that will likely result in future workgroups, a motion for HOD 2018, and even a future new Section! One take-away that I am delighted to share is the Innovation RC that was brought to the HOD this year, which charged the BOD to develop an incubator structure. 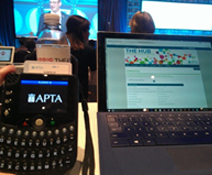 Caucusing started on the HUB discussion portal months ago, and intensified during the HOD last week, leading to opposing amendments from the maker of the motion and the APTA BOD. This resulted in swinging votes within delegations, and promised to make a potentially contentious and protracted debate on Wednesday (the final day of the House of Delegates). What a delightful surprise we had in receiving the updated ‘packet III’ at 3am on Wednesday, which included a single amendment that was endorsed by the formerly opposing parties, who found a way to compromise in a single offering to bring to the House floor. This motion moved to vote and passed in minutes. Respect and encouragement of minority opinions was honored throughout, making this governance process and leadership group a testament to the character of our colleagues in APTA HOD as well as the use of Robert’s Rules. We have colleagues across many states, from whom we learn ways to move our own state legislative initiatives forward. For instance, the PTA vote passed at the HOD this year, which was aided by discussions across all 50 states. Process, integrity, and shared mission in moving our profession forward are palpable themes I bring forward from my first time as your Illinois At-Large Delegate. I am honored to e part of this important process. Below is a photo of my voting card in the ARS device that we used, the HUB community page on my computer, and the Vice Speaker of the House visible on screen and onstage in the background." Mike, Of what was accomplished during the meeting, what do you think will have the greatest impact on the membership? "That the American Physical Therapy Association explore and, if feasible and advisable, develop model(s) of innovation centers to expedite the creation and growth of effective transformational innovations that revolutionize physical therapist practice and positively impact society." As it currently stands, physical therapists do not appear to have the tools and/or models to transform society given the numbers of individuals required to actually have a transformative effect. This motion, much like efforts to create a separate foundation for clinical research (the Foundation for Physical Therapy), will pave the way to create and fund a largely separate entity with a singular focus. The focus will be on INNOVATION. Innovation can be defined simply as a "new idea, device or method". However, innovation is often also viewed as the application of better solutions that meet new requirements, unarticulated needs, or existing market needs. Healthcare is changing rapidly and we don't know what tomorrow will bring and what new requirements we may need to meet. The opportunity for PT's to move into new markets has never been more open (think pop health or opioid crisis). This means we are members of a professional organization that will not only listen to innovative ideas from anyone but, actually have a process to bring these ideas to the market. The bottom line is we, as a profession, have an enormous opportunity to transform society. But we can't do it alone. The accomplishment of passing this motion will make sure we align well others along on the journey. Joe, What advice would you give to next year’s first-time attendees? Joe Hanley, PT, DPT, At- Large Delegate: "The best advice that I can give to the 1st timers for next year's House of Delegates is to soak up the experience and the knowledge. There are 400 delegates, and they represent the most involved, knowledgeable group of PTs and PTAs. There is incredible experience both within the Illinois delegation, and the House as a whole. My advice would be to simply attempt to learn as much as you can about the House, about the governance process that is in place, and about the profession. The House exists because the APTA is a member driven organization, and the House truly shows why and how this works." Barb, With this being your first year attending the House of Delegate as an Illinois Delegate, what was your main take away from this experience? 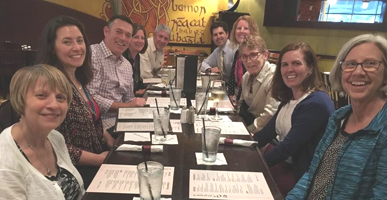 Barb Gutierrez, PT, DPT, NCS, North Central District Delegate : "My biggest take-away message is that we belong to a dynamic profession full of passionate, driven leaders who are dedicated to advocacy on behalf of our patients and society. It was humbling to be a part of and I’m already looking forward to next year in Orlando."